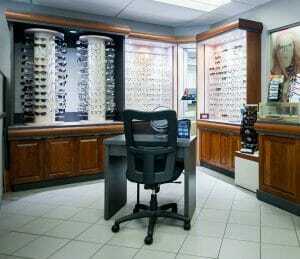 Northern Ophthalmic Associates is pleased to offer our patients a full-service optical shop at each of our four locations in Norristown, Jenkintown, Center City, and Northeast Philadelphia. Our skilled, certified opticians have over 20 years’ experience in eyeglass fitting to meet the needs of all our patients. 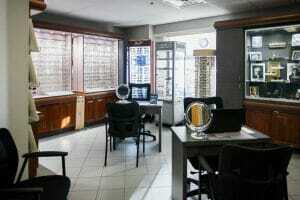 In addition, we offer the latest in lens technology and we have a full-service edging and finishing lab on the premises. Our opticians and staff members will work with you to help you find the perfect eyewear for your exact needs and goals. 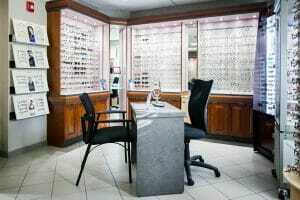 We can accommodate you if you need your eyes examined or have a current outside prescription. Our optical shop accepts CareCredit financing to make eyeglasses and contacts affordable for every budget. Our optical shop has an inventory of over 800 eyeglass frames, including many designer frames at reasonable prices. We can help you find a pair that fits your personality, style, lifestyle and budget. Some of our patients prefer to have multiple pairs for different occasions. Or, some patients prefer separate glasses for reading and distance vision. Whatever your needs, our service is fast and friendly. We provide the latest in progressive lens selection and fitting from Essilor including brands such as Varilux. A full range of lens options and state-of-the-art coatings are available with high-index lenses and anti-reflective coatings. With the right finish, your glasses can filter harmful light to reduce the risk of cataracts and macular degeneration. We can also recommend the lens material, thickness and coating based on your vision prescription and lifestyle. Once you have your glasses, we will help you keep your eyewear clean and fitting perfectly. With the right care, your glasses can last for many years. Contacts are a great alternative to eyeglasses. They offer an increased field of vision and are easier to wear during exercise and sports. People that dislike the way they look wearing glasses or have a very active lifestyle may prefer to wear contacts. All types of contact lenses are available at our optical shop, including disposable, gas permeable, daily wear soft and extended wear soft lenses. We also carry specialty contact lenses. Our opticians will help you select the type and brand that is best for your visual needs and lifestyle. If you are new to contact lenses, we will help you find a pair that fits comfortably, and we will explain how to wear and care for them. We can give you instructions on inserting and removing the lens so you don’t have any problems. Contact lenses require special care. They should be worn no more than 8-10 hours per day, and when removed, they should be kept in a clean case with cleaning solution. The solution must be changed daily and the case should be replaced every 90 days. If you have a question about visual aids, or if you would like to schedule an appointment with our team, please call or email Northern Ophthalmic Associates today.